PIR sensor based burglar alarm with SMS alert. This project is about a PIR sensor based burglar alarm with SMS alert. The circuit sensesÂ the intrusion using a PIR sensor and sends an SMS to to the given mobile number when an intrusion occurs. The number of intrusions taken place is also displayed on an LCD display. An 8051 microcontroller is used for monitoring the PIR sensor and sending the alert message using the GSM module. An alarm is also raised when the intrusion occurs. PIR sensor means passive infrared sensor. It is used to detect and measure the IR (infra red) radiations emitting from a source. The hear of the PIR sensor is a sensor core made of pyroelectric materials like Â Gallium Nitride. They simple produce an electrical output according to the intensity of IR radiations falling on it. In most cases an array of such sensors cores are used to improve detection. Numerous Fresnel Lenses arranged in the form of a dome is place on the sensor face to focus as much as IR radiations on to the sensor face.Â When ever a movement occurs in front of the PIR sensor, Â the intensity of the IR radiations falling on the PIR sensor changes and so do the sensors electrical out of the sensor. The electronic circuit inside the sensor detects this variation and pulls the output pin of the PIR sensor HIGH for sometime. Usually the output pin is pulled HIGH for 3 to 4 second. 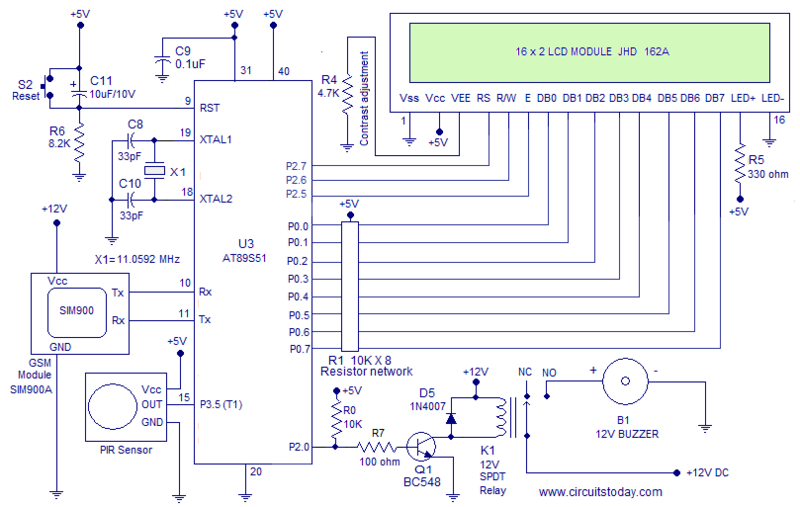 Read this article Interfacing PIR sensor to 8051. 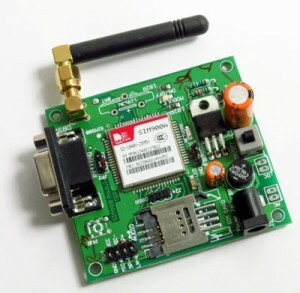 GSM (Global Systems fro Mobile communication) Module is a device that can accept a SIM card and operate in a GSM network. A GSM module can perform various tasks in the network such as sending messages, accepting messages, dialing a phone number, receiving calls, sending and receiving voice messages, sending digital media etc. In simple words a GSM module can perform any task that is supported by the module itself and the network service provider. The network actually sees the GSM module just like a mobile phone. The common applications of GSM module are appliance switching devices, messaging systems, voice mailing systems, FAX systems etc. The GSM module we are using here is based on a Â SIM900 GSM chip. Read this article Interfacing GSM module to 8051. The GSM module communicates with the 8051 using serial communication. Tx pin of the GSM module is connected to Rx pin of the microcontroller (pin10) and Rx pin of the GSM module is connected to Tx pin of the microcontroller. Output pin of the PIR sensor is connected to P3.5 of the microcontroller. Data pins (D0 to D7) of the LCD module are connected to Port 0 of the microcontroller. Each pins of Port 0Â are pulled up using a 10K x 8 resistor network. Port 0 of the 8051 is open drain Â and has no internal pull up resistor. SoÂ we need external pull -up resistors to make it work properly as output pins. Control pins (RS,RW and E ) of the LCD module are connected to P2.7, P2.6 and P2.5 of the microcontroller respectively. The LCD module we are using here is JHD162A. Read this article, Interfacing LCD module to 8051. Resistor R4 is used for setting the contrast of the display. Resistor R5 limits the current through the back light LED of the display. Push button switch S2, capacitor C11 and resistor R6 are associated with the reset circuit. Capacitor C11 is used to de bounce the push button switch. The C11 actually by-passes the vibrations produced when the push button switch is pressed. If C11 is not used, the microcontroller will read all the vibrations as key presses and the system will perform multiples resets. Crystal X1 and capacitors C8, C10 are associated with the clock circuitry. The baud rate used for serial communication in this project is 9600. So the crystal needs to be exactly 11.0592 MHz for getting this baud rate. Port 2.0 of the microcontroller is used for controlling the alarm. P2.0 is connected to transistor Q1 through resistor R7. R7 limits the base current of Q1.Â Resistor R0 (10K) is used for pulling up P2.0 pin. The relay is connected across the collector of Q1. D5 is a freewheeling diode. It by-passes the back emf produced when the relay is switched. If free-wheeling is not done, the back emf may destroy the transistor or even the microcontroller. The 12V buzzer is connected Â through the normally-open contact of the relay. MOV A,#34D        //ascii of "
MOV A,#"!" //ascii of ! MOV A,#"." //ascii of . GSM modules available in the market comes with different supply voltages like Â 12V, 9V, 5V etc. The moduleÂ Â I am using here operates on 12V DC. So make sure that your GSM module is operating on correct supply voltage. Make sure that all ground lines of (GSM module. PIR sensor module and rest of the circuit) are shorted together. Thanks Praveen, today I learned a lot about PIR sensor. I was quite confused regarding this area but now the doubts are clear.